Hossam Shaltout, PhD, researches the role of the brain in blood pressure regulation. Using a variety of preclinical and clinical models, he conducts autonomic function assessments to identify markers of disease, with collaborations focused on pharmacologic and noninvasive neurotechnology interventions for improved cardiovascular health. Early in his career, Shaltout worked in drug production and marketing for Novartis and as a pharmacology and toxicology instructor at the School of Pharmacy in Alexandria, Egypt. In 2005, he received a doctorate in pharmacology and toxicology from East Carolina University School of Medicine, where he studied cardiovascular pharmacology. 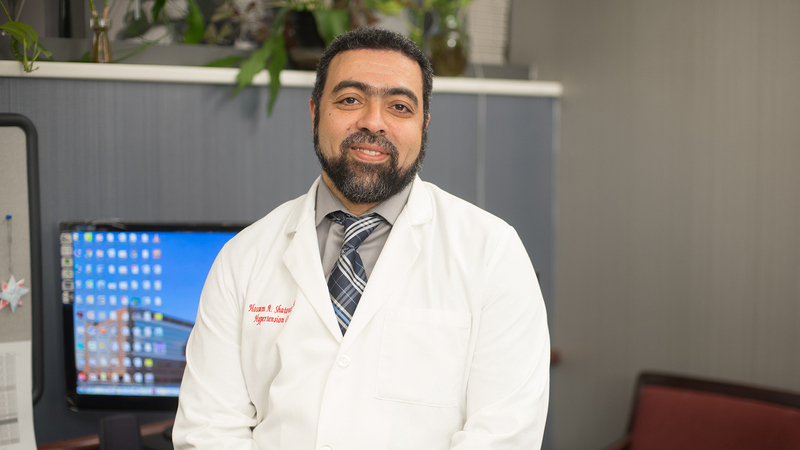 He completed his postdoctoral training at Wake Forest School of Medicine and joined Wake Forest’s Hypertension and Vascular Research Center as an assistant professor in 2011 to study neural control of the heart in various diseases. Through human subjects and animal models of sheep, rodents and nonhuman primates, Shaltout researches the interaction between the renin-angiotensin and autonomic nervous systems in different pathological conditions. Using a variety of methods, including tissue analysis, pulse wave velocity and blood pressure monitoring, he investigates the role of autonomic nervous system in cardiovascular health, metabolic syndrome, premature delivery, post-traumatic stress disorder and aging. For more than 10 years, Shaltout has researched the fetal origins of disease in sheep and adults exposed to betamethasone, a medication used to improve the outcomes of premature birth. He examines its effect on hypertension and metabolic disorder development, with the goal of identifying disease biomarkers and preventive strategies. Through funding from the American Heart Association, he studies vascular and autonomic function in children with postural orthostatic tachycardia syndrome and evaluates the impact of Vitamin D levels on disease severity. He also works with nonhuman primate models to investigate the effect of diet on cardiovascular function. Shaltout’s interest extends to non-pharmacologic interventions; he uses a noninvasive neurotechnology called HIRREM® (high-resolution, relational, resonance based, electroencephalic mirroring) to examine the neural effect of brain wave optimization on the overall health of participants enrolled in a clinical trial. He studies how sound therapy balances brain signaling and impacts blood pressure, heart rate, insomnia, migraine health and post-traumatic stress disorder. As director of the Hypertension Clinic at Wake Forest School of Medicine, Shaltout uses advanced technologies to assess autonomic function. His collaborations focus on assessing the cardiovascular effects of therapeutic interventions and conducting pharmacologic testing for safety and efficacy.